"CSAs are vital, and so are CSGs: Community Supported Grieving," says Laurence Cole, a large doundoun between his knees. I hear the call of the drum. I hear the cry of hearts frozen in anger and fear, hearts longing to burn freely with passion for life. Longing to appropriately channel our ferocity for honoring Mother Earth, longing to be fed by the wisdom that arises and thrives only in community. In my query of how we can learn new and wonderful ways to support each other in grieving, I have been part of Frances Weller's grief weekend in Point Reyes, California. I was privileged to be part of Sobonfu Some's African grief-tending ritual weekend in Asheville in November, 2015.. Now she is on the other side, and I feel her spiritual intelligence informing me now. But I am a white woman and although I can borrow from the wisdom of African ritual, I have to weave together the blanket of care that is most authentic for me, that allows me and those around me to best give our gifts. 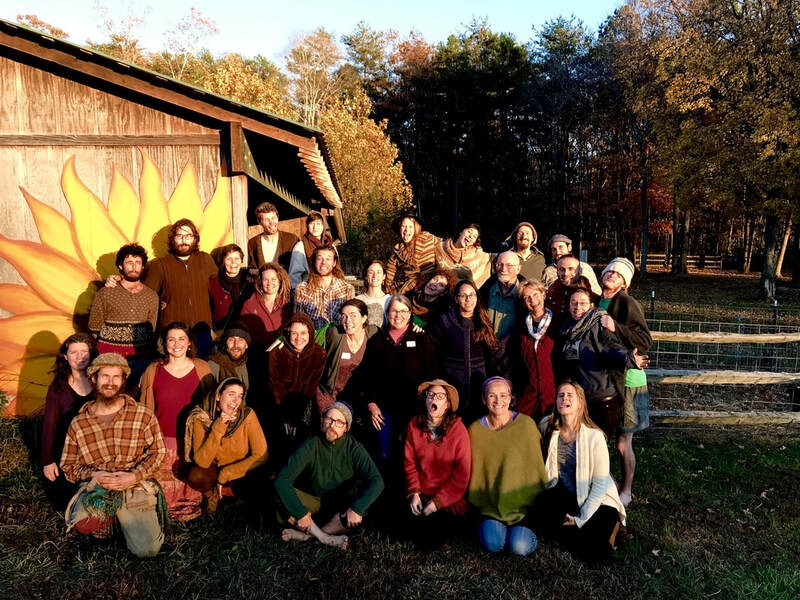 There are not words for what we "did" this past weekend in Grief Tending with Laurence Cole at the Eco-Institute in Chapel Hill (what an amazing placed!! I encourage you to check out their beautiful vision and offerings, in the spirit of John Muir and Wendell Berry. What we did this weekend will be evidenced in the fruits to follow. I call on those in the Asheville area to join me in supporting the May 5-7 weekend I am envisioning: The Transformative Power of Community-Supported Grieving. Together, we will create many opportunities for healing. And so it is. 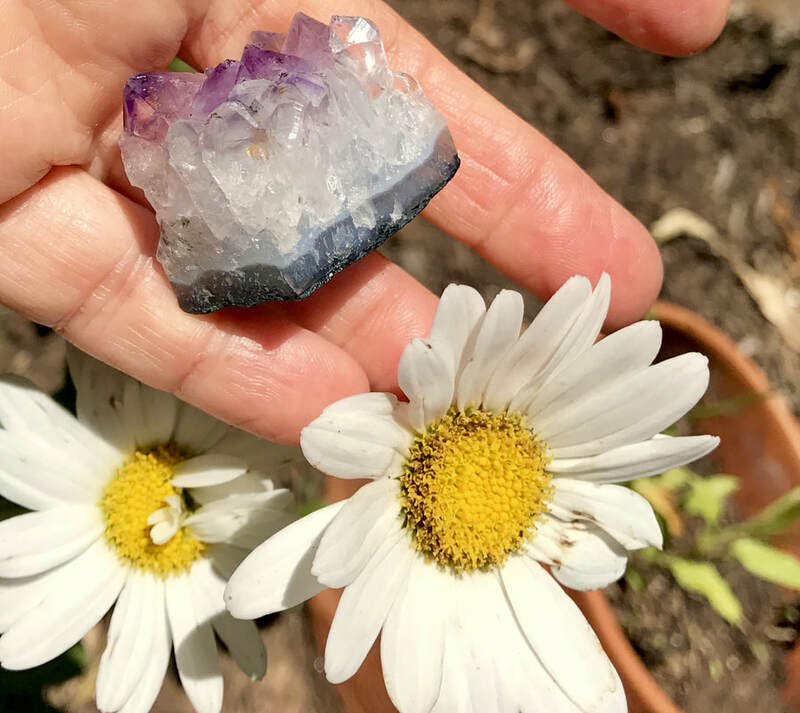 I realized," he said, picking up a small amethyst from the table in front of him, "the last time I was feeling the grief, that I needed to stay with the heavy feeling. That if I tried to distract myself by staying busy, or any of my other favorite distractions, it would be worse later. So I stayed with it. And afterwards, I was certain that it helped speed things along." At the Grief and Praise Circle, all feelings are welcome and tears are celebrated. We often share ideas, vulnerabilities, and hopes as we navigate the uncharted territory of grief. We light a candle and set an intention for our hour together, and when we look at each other, it is through the eyes of compassion. We are also learning how to view our own lives and histories with compassionate hearts. We speak of wanting to let loose of some of the fear around grief, wanting to relax around the whole idea of it, wanting to stop ignoring what needs to be grieved, in our own bodies and in the world. We give thanks for being in the circle and sing a simple song. There is a NEW MONTHLY DATE for our Grief and Praise Circle. I have been appointed to the Town of Black Mountain Urban Forestry Committee, which meets on the first Tuesday of each month. So, the Grief and Praise Circle will now meet on the SECOND TUESDAY of each month, same location and time. However, I have a lot of travel in August, so our AUGUST MEETING will be an anomaly, the only date I've got open, Thursday, August 10, 6 pm. Please join us for the mystery of opening to the transformative path of grief and praise. Feel free to bring a poem or a song or a piece of art or anything that represents your grief process, or your lack of ability to grieve. Did I tell you that in the first year after my daughter's passing, the grief felt weirdly like being in love? Like the first stages of falling, falling, falling in love. The constant ache for the other. Feeling both the nearness of the beloved and the absence of the beloved pulling you in different directions, equally pungent in the body. As if your skin is in constant motion. As if a smoldering melancholic breeze is pushing each hair follicle this way and that, and will not let you be. There is no peace for lovers and grievers, because we cherish our sweet agony. I did not take antidepressants but settled into caffeine overdosing and a temporary lapse into cigarette smoking off and on that first year, grateful for the numbness it brought to my body and psyche. For me, going through the agony eyes wide open was the only way. And yet, I saw myself coveting the pain, leaning over it, cuddling it, petting it and cooing... and even when I recognized myself as Gollum in Lord of the Rings—obsessed—I could not or did not stop because the precious pain felt like all I had to connect with my beloved daughter who still feels both so present and yet so utterly gone. But all obsessions must end, and I knew that if I was to create a worthy ending to it, I would have to gather up a nearly superhuman force of will to loosen my grip on the precious pearl of pain. I began to convince myself that grieving, and missing her, could still go on without so much hurting. I gave myself permission to endure my grieving process exactly as long as I needed it. If you asked me for advice, I would beg you to cry for your losses. To recognize that time must be taken. It doesn't matter how many years, truly, but know that you do have an end goal and that is to free yourself to live more fully than ever. Your beloved's life mattered. Now make the loss of your beloved matter. Heal. What tightens our grip on the pearl of pain is that the soul, I believe, feels everything that ever happened at once, as if it were in a mural and not in linear time. I would argue that to the soul, all events are still in motion, however small, however pronounced. This spring, I went through a half-dozen sessions of EMDR (Eye Movement Desensitization and Reprocessing) therapy. One of the main tenants of your learning is to begin to understand that "that was then, and this is now." People who haven’t been lost in the throes of grief and trauma won't understand how helpful it is to begin to tell yourself over and over: that was then; this is now. The moment of first hearing that horrible news, what you saw and heard, can be over. The shock waves of the events don’t have to keep slamming me up against a wall each time I long for my daughter. As the therapist and I work past the layers of trauma into the core of the grief, he asks, “So, aside from those things, now what would you say is the worst part?" And I answer: Missing her. My salvation these past four years has centered around working with concepts in Richard Schwartz’s books on Internal Family Systems Therapy and seeing myself as a composite of different parts. I had to find a way to extricate myself from the grieving mother, because she is all-encompassing. For the grieving mother, there is absolutely no relief, because the grieving mother wants one thing and one thing only: the child returned to her arms. Frankly, the only way I was able to draw breath from moment to moment these past four years was to keep working to locate some approximation of a higher self, an integrated and wiser self, who can wrap her arms around that grief-stricken mother and let her weep in peace. Let her wail and rant for as long as she needs to. And return again and again whenever I hear her cry out. This blog post marks the first time I have publicly talked about losing my daughter since the stupid car wreck four years ago. All of my feelings went underground because there were too many of them hammering around inside of me constantly. I soldiered on, as most of us do. And this is why I host a grief circle: because I hold a firm conviction that the world would be a better place if more people stopped what they were doing in this very instant and simply wept. June 6, 2013 is when we lost Corey. That July, utterly lost, I stumbled into the Wild Goose Festival for the first time, and those people, those strangers, held me like I have never been held before. Wild Goose, I learned, is a camping festival driven by music, story and art, for people of all ages, colors and persuasions, grounded in faith-inspired social justice, held right here at the Hot Springs, NC campground. Two years later, I became a presenter along with Lyndon Harris on grief and forgiveness. Lyndon and I will present again this year by the river at 11 am, Friday, July 14. Grief is how love honors what it misses. To forgive is to save a life and realize that that life is yours. (c) 2017 Sheridan Hill. The contents of this website are copyrighted and will appear in an upcoming book. N.C. sculptor Be Gardiner created this piece when he was in the process of giving up art to become a Buddhist monk. Some people look at it and say, "What a peaceful presence," and others say, "That's scary...so severe." Just as beauty is in the eye of the beholder, so is danger. It turns out that there is a bigger link between grief and trauma than you thought. Last month, one of our regular Grief and Praise Circle attendees brought me a worthy book, "The Body Keeps the Score: Brain, Mind, and Body in the Healing of Trauma," written by a guru of trauma therapy, Bessel Van Der Kolk. Van Der Kolk’s journey working in psychiatric hospitals and with U.S. veterans of different wars has much to tell us about what remains uncovered in the links between trauma and mental health. In training in clinical settings, he began to form questions about trauma before PTSD (post-traumatic stress disorder) had reached the nation's radar. As he began to form and then test theories about trauma, Van Der Kolk was able to prove that the brain and body of a traumatized person continues to secrete large amounts of stress hormones long after the danger has passed. Everyday annoyances—loud noises, sudden noises, surprises and disappointments of any kind—will cause adrenalin and other stress hormones to pump through the brain and body, and can also cause the initial trauma to repeat in the mind’s eye. The unfortunate cycle that sets up and repeats is that the person is never released from the continuing pain of the initial trauma. 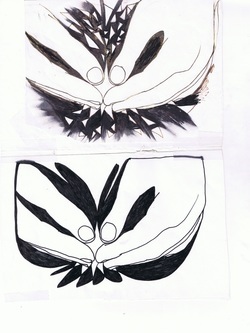 Further complicating the experience for people with trauma is Van Der Kolk’s discovery that, in trauma, the parts of the brain that rule speech are diminished. When you are in the grip of trauma after-effects, you have a physiologically reduced capacity to tell anyone what is going on with you. Join us Tuesday, May 2, at 6 pm in Black Mountain, for our monthly Grief and Praise Circle, where we will make gentle inquiry into the relationship between grief and trauma, and look at how we can reorganize perception. Speaking is optional; the important thing is to get your body in the presence of others who can be present with you. Email us for location. While the Grief Circle is on pause, I want to offer what I hope will give you a moment of levity around the subject of death and dying. I never cease looking for an opportunity to smile at the ravages of fate, and I found a delightful moment in a book that emerged from the boxes of my recent move. My favorite books are the ones most obscure, which will never make the NY Times top 20 list. To be honest, many, if not most, of the books on the bestseller lists aren’t worth my time. Give me books that were written out of a pure passion for the subject. Such a treasure is Patrick Ober’s book, “Mark Twain and Medicine: Any Mummery Will Cure.” I knew Ober when we both worked at Wake Forest University/ Baptist Medical Center in Winston-Salem; the book was published, understandably, by the University of Missouri Press in the state where Samuel Clemens, i.e. Mark Twain, lived. In one of my favorite passages, Ober offers up Clemens’ famous humor around the subject of death and dying. Thanks to Patrick Ober for bringing us new ways to love, and laugh with, the great American writer Mark Twain. Tuesday night in the sweet little Grief and Forgiveness Circle we will take a few moments to ask the inner question: Do I need to forgive Life in general for not giving me what I wanted? It has taken me decades to see the wisdom in admitting that part of me is broken, part of me is a vulnerable and innocent child who is lost in a big, scary world, and, yes, if I am truthful I must say that a part of me secretly harbors varying levels of resentment towards Life and Death for taking away some of the people I loved most. It wouldn't hurt, and might help, if I took a few moments to let go of that disappointment, to touch it as lightly as a butterfly lights on this flower and that. Life will forever be a mix of beauty and contrast, just as this morning's air, alive with birdsong, is tainted with diesel fumes from nearby construction vehicles while my eye spots in the fig tree the first purple fruit calling out to me. The inherent beauty of the Circle is that the minute you sit down in one of the chairs on the deck by the river, you have eliminated the weight of feeling alone. Feeling alone, we cannot open fully towards the part of us that hurts, and continuing to ignore that part of yourself makes you a stranger to yourself. As Maladome Some says, alienation is one of the faces of modernity. The cure is a new sense of togetherness. If you hear the song of the circle, join us Tuesday, Sept. 13 at 6 pm for an hour on the back deck of the Swannanoa Valley Friends Meetinghouse, 137 Center Avenue, Black Mountain, NC. You are encouraged to look for an object, a song, a poem, or some creative expression of your grief and to bring it with you to the circle. Speaking and sharing are optional but encouraged. Grief is active, it is passionate, it is full of heat, full of life. Often, it is full of anger as well. We come together in the Grief and Forgiveness Circle to acknowledge our humanness, our broken heartedness over loss and change. Grief is not stagnant. Grief is not silent...for long, because grief relentlessly calls us to some form of expression. To not acknowledge your losses is to refuse the most precious part of you; the part that loves freely, knowing that what we love we may lose. Please join us Tuesday night, August 23, from 6 to 7 pm at the Swannanoa Valley Friends meetinghouse, 137 Center Avenue, Black Mountain, NC. Weather permitting, we meet on the back deck. Otherwise, inside. You are encouraged to bring something that represents your grief: a poem, a song, an object, a stone. The circle is free; a donation of a dollar or two for the meetinghouse is appreciated. You've been thinking that a grief circle is for other people, right? Not for you. Maybe you've pictured people sitting around crying and being comforted, and that scene doesn't appeal to you. How embarrassing! Besides, you have no reason to cry. And if you did, you would have no reason to cry publicly, for sure. Ah, but unless your head is under a rock, you have at least one ear turned towards the ongoing cries for mercy and justice and peace for our fellow beings and for Mother Earth. Driving your car you attempt to puzzle through, and you secretly mourn, the American massacre in Orlando of innocent people gathered during spring break at a gay nightclub. In your gut, anger seethes at the heartbreaking injustice and the sense of futility. Yes, there is reason to cry. There is a need to come together in circle to acknowledge, with words or silently with the presence of our bodies, the human heart breaking open. It is happening whether you want it to or not, whether you admit it or not, whether you are campaigning for a cause or not. We are being broken open and we need each other to get through it in a way that might help create a better future. We were not created to act like machines who cannot cry. We are not meant to deny grief. We are not meant to walk around hurting and ordering another cappuccino to push past it. We have a primal need to sit in circle and acknowledge the reality of grief and reasons to grieve. I believe that if more people could learn to grieve, fewer people would hate each other. Fewer people would kill others, fewer people would take their own lives. Because grief is the great human equalizer. In grief, you are forced to realize that, in the end, every human heart will stop beating. SIiting in circle, we are supported in acknowledging the inherent vulnerability of life itself and the fragility of the human condition. The Life and Grief Circle meets on the second and fourth Tuesday of every month. All are welcome. If you can't join us tonight in person, join us in spirit from 6-7 pm. We will meet for an hour on the back deck of the Swannanoa Valley Friends Meetinghouse, 137 Center Avenue, Black Mountain, NC.